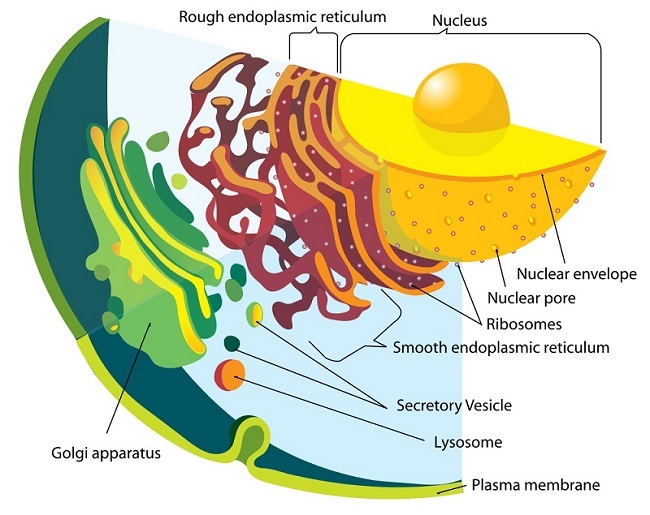 The endoplasmic reticulum (ER) is a large organelle made of membranous sheets and tubules that begin near the nucleus and extend across the cell. The entire structure can account for a large proportion of the endomembrane system of the cell. For instance, in cells such as liver hepatocytes that are specialized for protein secretion and detoxification, the ER can account for more than 50% of the total lipid bilayer of the cell. Similarly, the ER membrane system is particularly prominent in pancreatic beta cells that secrete insulin, or within activated B-lymphocytes that produce antibodies. 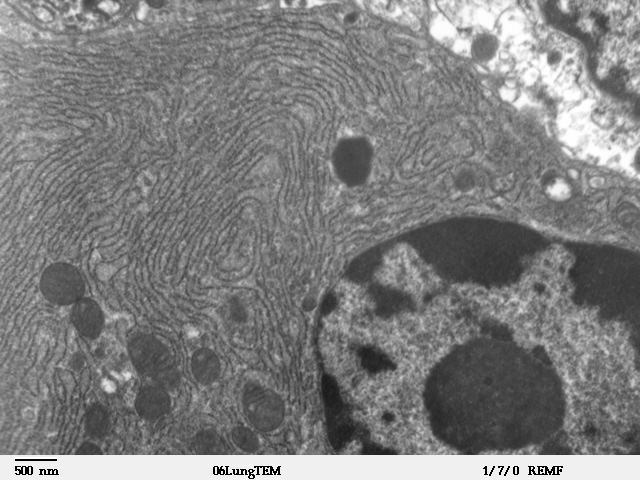 As seen in the image, the membranes of the endoplasmic reticulum are contiguous with the outer nuclear membrane, even though their compositions can be different. The ER contains special membrane-embedded proteins that stabilize its structure and curvature. This organelle acts as an important regulator of cell function because it interacts closely with a number of other organelles – from the plasma membrane and Golgi network, to mitochondria and peroxisomes. It can even influence mitochondrial fission, and change the aerobic status of the cell. This is a microscopic image of a section from mammalian lung tissue. The bottom right corner of the image shows the nucleus and the rest of the picture illustrates the extensive nature of the ER. Small dark circles are mitochondria that exist in physical proximity with the membranes of the ER. There are two major types of ER within each cell – smooth endoplasmic reticulum (SER) and rough endoplasmic reticulum (RER). Each has distinct functions, and often, differing morphology. The SER is involved in lipid metabolism and acts as the calcium store for the cell. This is particularly important in muscle cells that need Ca2+ ions for contraction. The SER is also involved in the synthesis of phospholipids and cholesterol. It is often located near the periphery of the cell. On the other hand, the RER is commonly seen close to the nucleus. It contains membrane-bound ribosomes that give it the characteristic ‘rough’ appearance. These ribosomes are creating proteins that are destined for the lumen of the ER and are moved into the organelle as they are being translated. These proteins contain a short signal created by a few amino acids in their N-terminus, and are initially translated in the cytoplasm. However, as soon as the signal is translated, special proteins bind to the growing polypeptide chain and move the entire ribosome and associated translation machinery to the ER. These polypeptides could be resident proteins of the RER, or be moved towards the Golgi network to be sorted and secreted. The endoplasmic reticulum membrane system can be morphologically divided into two structures–cisternae and sheets. Cisternae are tubular in structure, and form a three-dimensional polygonal network. They are about 50 nm in diameter in mammals and 30 nm in diameter in yeast. ER sheets, on the other hand, are membrane-enclosed, two-dimensional flattened sacs that extend across the cytoplasm. They are frequently associated with ribosomes and special proteins called translocons that are necessary for protein translation within the RER. The high-curvature of ER tubules is stabilized by the presence of proteins called reticulons and DP1/Yop1p. Reticulons are membrane-associated proteins encoded by four genes in mammals (RTN1-4). These proteins localize to ER tubules and the curved edges of ER sheets. DP1/Yop1p are a class of integral membrane proteins involved in stabilizing the structure of ER cisternae. Both reticulons and DP1/Yop1 proteins form oligomers and interact with the cytoskeleton. Oligomerization seems to be one of the mechanisms used by these proteins to shape the lipid bilayer into a tubule. Additionally, they also appear to use a wedge-like structural motif that causes the membrane to curve. These two classes of proteins are redundant, since the overexpression of one protein can compensate for the lack of the other protein. The construction of the ER is intimately involved with the presence of cytoskeletal elements – especially microtubules. ER membranes, especially cisternae, move and branch along microtubules. When microtubule structure is temporarily disrupted, the ER network collapses and reforms only after the microtubule cytoskeleton is reestablished. In addition, changes to the pattern of microtubule polymerization are reflected in changes to ER morphology. The ER plays a number of roles within the cell, from protein synthesis and lipid metabolism to detoxification of the cell. Cisternae are commonly associated with lipid metabolism since they often create SER. They also appear to be important in maintaining the Ca2+ balance within the cell and in the interaction of the ER with mitochondria. This interaction also influences the aerobic status of the cell. ER sheets appear to be crucial in the response of the organelle to stress, especially since cells alter their tubules:sheets ratio when the number of unfolded proteins increases. Occasionally, apoptosis is induced by the ER in response to an excess of unfolded protein within the cell. When ribosomes detach from ER sheets, these structures can disperse and form tubular cisternae. Although ER sheets and tubules appear to have distinct functions, there isn’t a perfect delineation of roles. For instance, in mammals, tubules and sheets can interconvert. In yeast, ribosomes are found on ER tubules and mammalian ER cisternae can contain translocon proteins as well. The relationship between structure and function in the ER has not been completely elucidated. Protein synthesis occurs in the RER. Although translation for all proteins begins in the cytoplasm, some are moved into the ER in order to be folded, and sorted for different destinations. Proteins that are translocated into the ER during translation are often destined for secretion. Initially, these proteins are folded within the ER and then moved into the Golgi apparatus where they can be dispatched towards other organelles. For instance, the hydrolytic enzymes in the lysosome are generated in this manner. Alternately, these proteins could be secreted from the cell. This is the origin of the enzymes of the digestive tract. The third potential role for proteins translated in the ER is to remain within the endomembrane system itself. This is particularly true for chaperone proteins that assist in the folding of other proteins. The genes encoding these proteins are upregulated when the cell is under stress from unfolded proteins. The SER plays an important role in cholesterol and phospholipid biosynthesis. Therefore, this section of the ER is important not only for the generation and maintenance of the plasma membrane, but of the extensive endomembrane system of the ER itself. The SER is enriched in enzymes involved in sterol and steroid biosynthetic pathways and is also necessary for the synthesis of steroid hormones. Therefore the SER is extremely prominent in the cells of the adrenal gland that secrete five different groups of steroid hormones that influence the metabolism of the entire body. The synthesis of these hormones also involves enzymes within the mitochondria, further underscoring the relationship between these two organelles. The SER is an important site for the storage and release of calcium in the cell. A modified form of the SER called sarcoplasmic reticulum forms an extensive network in contractile cells such as muscle fibers. Calcium ions are also involved in the regulation of metabolism in the cell, and can change cytoskeletal dynamics. The extensive nature of the ER network allows it to interact with the plasma membrane and use Ca2+ for signal transduction and modulation of nuclear activity. In association with mitochondria, the ER can also use its calcium stores to induce apoptosis in response to stress. Endosymbionts – Organisms that live within other organisms. Mitochondria are considered ancient endosymbionts of early eukaryotic cells. 1. Which of these is true about the endoplasmic reticulum? A is correct. 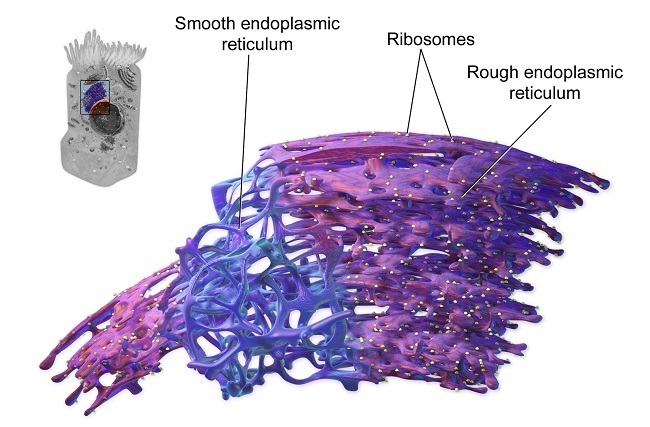 The formation of the endoplasmic reticulum is dependent on the cytoskeletal machinery of the cell. In particular, microtubules are closely associated with these organelles and drugs that interrupt microtubule polymerization directly affect the morphology of the ER. There is some evidence to support the role of actin filaments as well, though the importance of intermediate filaments is not very clear. The ER is made of tubular cisternae and two-dimensional sheets. However, the diameter of cisternae rarely exceeds 60 nm. In yeast, they are even smaller, with a diameter of about 30 nm. The lumen of the ER is also contiguous with the perinuclear space – the region between the inner and outer nuclear membranes – not the plasma membrane. While the ER is involved in protein secretion, those proteins are first moved through the Golgi network. 2. Which of these is a function of smooth endoplasmic reticulum? D is correct. The SER forms a three-dimensional polygonal network across the cell and is often made of cisternae. It contains a number of enzymes involved in sterol and steroid hormone synthesis. Its role in the creation of cholesterol and phospholipid makes it important in the generation and maintenance of the plasma membrane and the entire endomembrane system. It also stores and releases calcium – a function that is particularly important in excitable cells. 3. Which of these is true about the functions of proteins that stabilize the structure of the endoplasmic reticulum? B is correct. DP1 and its yeast homolog, Yop1p, are integral membrane proteins that can oligomerize. These oligomeric structures form a scaffold that stabilizes ER cisternae and the curved edges of ER sheets. Translocons are protein complexes that transport a nascent polypeptide into the lumen of the ER. They are not directly involved in maintaining the structure of the organelle itself. Reticulons are another group of proteins involved in ER structure. Though they contain wedge-like structural motifs, those parts of the protein are inserted into the outer leaflet of the ER lipid bilayer. This insertion causes the membrane to curve and, like DP1, is involved in the generation of ER structure.